The client had recently purchased a single family home and wanted to make a number of structural as well as spatial improvements (opening up the parlor wall to the adjacent hall) and needed to create a second bathroom where one had previously existed. For the new bathroom, the existing space was tiny but had an existing skylight. In order to maximize the spaciousness of the room, we wanted to create as few separations as possible - typically between shower or bath and the rest of the room. 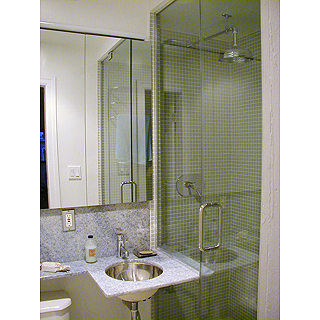 The boundary between room and shower is blurred by creating a built - in shower with a frameless glass door and panels. The same tile inside and out. The tiled shower seat slides out of the shower and the stone vanity counter slides into the shower, further breaking down any sense of enclosure.